The profiles feature autobiographical information as well as a description of each mathematician's work. In addition, each profile contains a complete bibliography, a curriculum vitae, as well as photos — old and new. As an added feature, interviews with the Laureates are presented on an accompanying web site (http://extras.springer.com/). The book also presents a history of the Abel Prize written by the historian Kim Helsvig, and includes a facsimile of a letter from Niels Henrik Abel, which is transcribed, translated into English, and placed into historical perspective by Christian Skau. 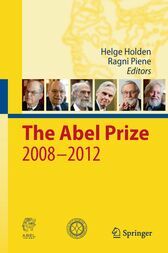 This book follows on The Abel Prize: 2003-2007, The First Five Years (Springer, 2010), which profiles the work of the first Abel Prize winners.